The sessions during VIF19 range from Digital government for good; Smart, connected and sustainable cities; Digital citizenship for safe and responsible use of technologies; Impact-tech: Accelerating social impact through new technologies…. “Two important factors of the Swedish society are openness and transparency. Today, 94.0% of Swedes use Internet and Sweden has among the fastest connection speeds in the world. The wide usage of technology and Internet have enabled Sweden to foster its culture of openness, access to information, innovation and entrepreneurship, resulting in its innovation, growth and prosperity as today. There is no smart society without smart and internet-savvy citizens”, said Swedish Ambassador Pereric Högberg on the importance of Internet and digitalisation in improving people’s lives and branding a nation’s competitiveness. As part of the VIF19 and in cooperation with Lund University, one of Sweden’s top ranked universities, one enterprise or individual from Vietnam will be honoured in a ceremony for their work in social innovation in a digital context. The winner will be awarded with a prize of 1,000 USD plus a grand trip to Sweden to experience Swedish innovations. Increased Internet access will contribute to the implementation of the 2030 Sustainable Development Goals (SDGs). Among the 17 SDGs is Goal 9 which aims to “significantly increase access to information and communications technology and strive to provide universal and affordable access to the Internet in least developed countries by 2020”. Overall, the Internet will also be essential for the implementation and monitoring of the SDGs. UNDP Resident Representative a.i. Caitlin Wiesen stressed the importance of young tech entrepreneurs in addressing some of the greatest challenges we face in society, “As UNDP, we are actively seeking new approaches and breakthrough solutions to combat climate change, fight corruption, end poverty and reduce inequality. Across the world, it is young innovators who are embracing new technology and the internet to shape society,” she added. “Connecting these innovators and disruptors with creative platforms, is key to helping us achieve the Sustainable Development Goals by 2030”. “UNESCO is again delighted to be a part of the Vietnam Internet Forum. It’s a great way for everyone involved to see how the digital revolution is unfolding in Vietnam – and the opportunities and challenges that come with it. For us, it’s a conversation that can inform our work and our approach to issues of communication and information in Viet Nam, making sure our work is relevant to the country’s context and the aspirations – and innovations – of youth,” noted Mr Michael Croft, Representative of UNESCO to Vietnam. Mr. Vu The Binh, General Secretary of Vietnam Internet Association stressed: "Vietnam has accessed internet now for 22 years. Besides the well-developed infrastructure and technologies that can serve well for a local market of 95 million population with over 60% of internet users, Viet Nam is now facing with the challenge of addressing some legal, social issues arising from emerging technologies. VIF 2019 continues to be a great opportunity for having different views about "life on the Internet" in an open environment so that we can all head towards the establishment of a better digital society". 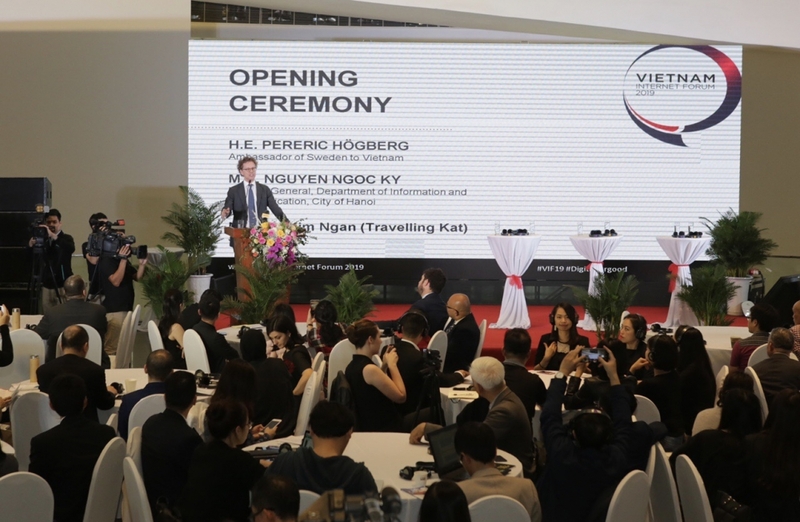 Organised for the second time since 2017, VIF19 is one of the important events in 2019 to commemorate 50 years of diplomatic relations between Sweden and Vietnam (1969 – 2019). 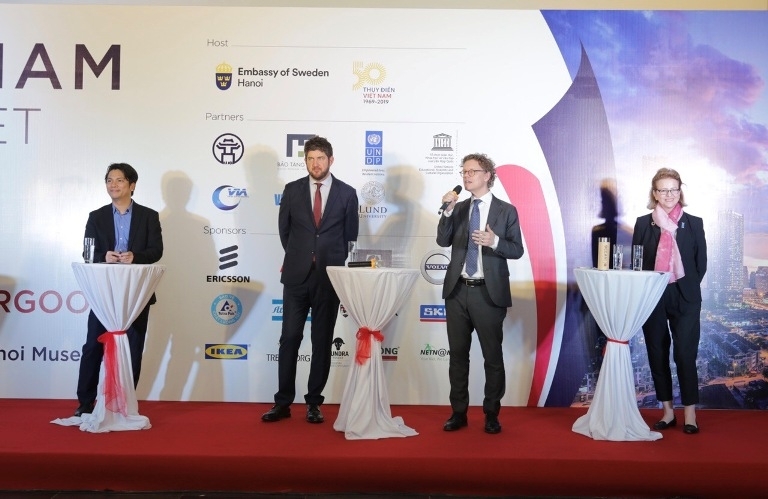 VIF19 is co-hosted by the Embassy of Sweden in Vietnam and the Hanoi People’s Committee. Key co-organisers and partners include United Nations Development Programme (UNDP), United Nations Education, Scientific and Cultural Organisation (UNESCO), Lund University (Sweden) and The Vietnam Internet Association. Vietnam Internet Forum is platform where government officials, business leaders, academia, social entrepreneurs, NGOs, investors and other relevant stakeholders come together to discuss Internet’s contribution to an innovative and progressive society.